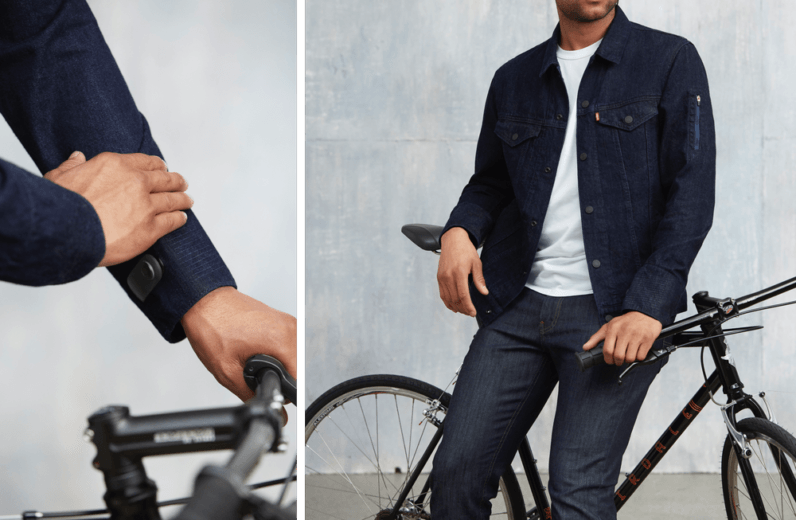 Google and Levi’s have partnered to release a denim jacket with touch sensitive controls and Bluetooth connectivity, proving once and for all that we are, in fact, living in the future. The Levi’s Commuter Trucker Jacket, as it’s called, allows you to do basic gadget things like Playing and pausing music, getting directions (via audio on your phone), or reading oncoming messages. You can assign different features to gestures via an accompanying app. While the fabric itself is touch sensitive around the cuff, the brains of the operation are located in a snap tag on one of the cuffs, which is the biggest giveaway that the jacket is also a gadget. It also provides haptic feedback and comes with an LED for notifications. It’s not quite as seamless as it could be, but it’s just the first phase of a new technology. Google first showed off the tech, dubbed Project Jacquard, at Google I/O a couple of years ago, integrating touch-sensitive fibers into clothing that felt and behaved like regular textiles. While it was a cool concept – as one so often sees at tech conferences – I didn’t quite expect to see it in a retail product so soon. The jacket itself looks pretty… normal, but I guess that’s the point. It’s meant to keep you warm while cycling, and you can wash it after remove the snap tag (how long until someone forgets though?). There’s pretty much no way a passerby would be able to tell there’s some tech magic literally woven into the fabric. If you’re interested in picking one up, the jacket goes on sale Wednesday at ‘select shops,’ although Google did not provide a price. Next week it will be available online at Levis.com and in more stores.